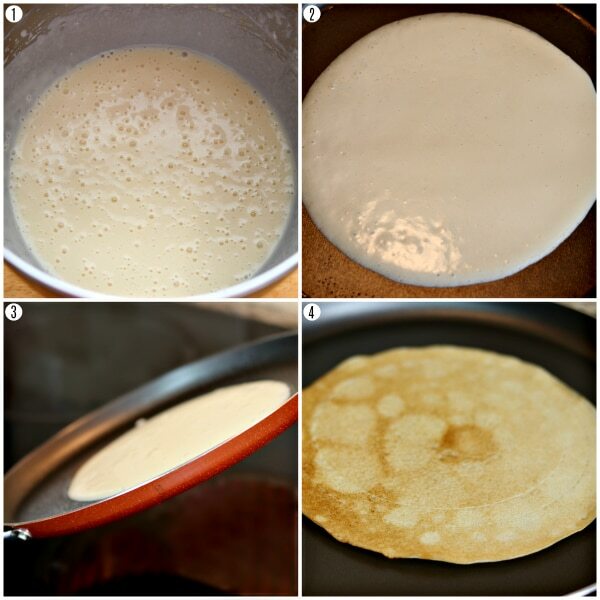 Learn how to make crepes at home with this easy gluten-free crepe recipe! Crepes can be sweet or savory. Perfect for a special breakfast or dessert. Recipe with a dairy-free option. 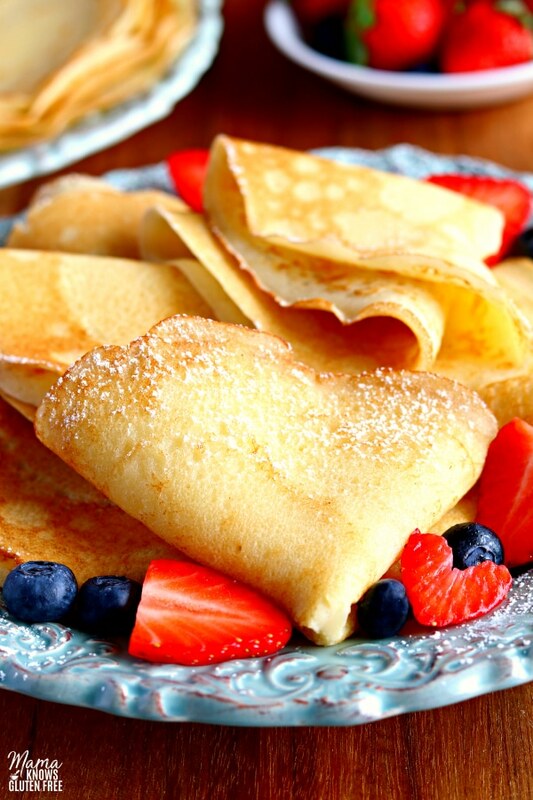 One of my favorite special breakfasts my mom would make on the weekends were crepes. She made sweet crepes with strawberries and made savory crepes stuffed with scrambled eggs and bacon topped with hollandaise sauce. I make my fluffy Gluten-Free Pancakes for my kids every week, and they love them! I wanted to share the special breakfast that my mom used to make with them. A lot of crepe recipes use a blender to mix the batter. I wanted an easy crepe recipe that would use a hand mixer because not everyone has a blender. They turned out perfectly and my kids loved them! Slide the crepe onto a plate, laying it flat. 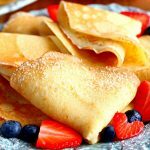 Serve the crepes rolled or folded into triangles with your favorite fillings or toppings. Enjoy! Store leftovers in an air-tight container for several days or in the freezer for up to two months. Thaw frozen crepes on the counter before gently peeling apart. If you refrigerate the crepe batter for 1 hour, it will help keep the crepes from tearing during cooking. The batter will keep for up to 48 hours. For savory crepes, omit the granulated sugar and pure vanilla extract and add a 1/4 teaspoon salt and your favorite herbs to the crepe batter. I use a crepe pan. Fill with whipped cream and sliced strawberries. Spread with peanut butter, add sliced bananas and drizzle with chocolate sauce. Fill with scrambled eggs and bacon and top with Hollandaise sauce. Can Crepes be made ahead of time? Yes, the crepe batter can be made the night before and stored in the refrigerator for up to 48 hours. You can store the cooked crepes in an air-tight container for up to two days before serving them. How to store crepes: Once cooled, stack the crepes on top of each other and store in an airtight container. Refiergrate up to 5 days. Can Crepes be frozen? Yes, they freeze well. Store in an airtight container for up to 2 months. Thaw frozen crepes on the counter before gently peeling apart. How to reheat Crepes: Microwave for 10-15 seconds. Please watch your microwave because all microwaves are different. 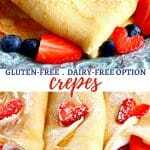 These gluten-free crepes were made with a rice flour blend. I like Pillsbury gluten-free flour. Not all gluten-free flours are created equal. You may experience different baking results depending on the gluten-free flour blend you choose. I have also included a dairy-free option for the recipe. My husband, myself and youngest son are all dairy-free as well. So now, you too can enjoy gluten-free and dairy-free crepes. For the dairy-free version of this recipe, I used Smart Balance butter and almond milk. These gluten-free crepes are made with a few simple ingredients and are super easy to make. Not only are crepes great for breakfast, but dessert too! You can even make them savory and have them for dinner. 3/4 cup milk , dairy-free use almond, cashew or coconut milk. In a large bowl, whisk the eggs with your hand mixer or stand up mixer. Add all of the rest of the ingredients and mix on medium for 1 minute and until all the ingredients are fully combined and the batter is smooth. Spray a non-stick pan with gluten-free cooking spray. Pour 1/4 cup of the batter into the center of a greased pan. Pick up the pan from the stove and swirl the pan to spread the batter evenly make a circle. Cook over medium heat for 30-45 seconds or until browned on the bottom. Flip the crepe over and cook for about 30 more seconds, until brown on the other side. Repeat with the remaining batter. The best way to measure gluten-free flour is the “spoon & level” method. Using a spoon, scoop the flour into the measuring cup. After you’ve spooned the flour into the measuring cup, use the back of a knife to level off the top of the measuring cup. If you refrigerate the crepe batter for 1 hour it will help keep the crepes from tearing during cooking. The batter will keep for up to 48 hours. Store in an airtight container and they can be frozen for up to 2 months. Thaw frozen crepes on the counter before gently peeling apart. The crepe batter can be made the night before and stored in the refrigerator for up to 48 hours. You can store the cooked crepes in an air-tight container for up to two days before serving them. Once cooled, stack the crepes on top of each other and store in an airtight container. Refiergrate up to 5 days. Reheat the crepes in the microwave for 10-15 seconds. Please watch your microwave because all microwaves are different. Great and easy to make. 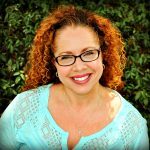 Thank you so much Lourae for the wonderful 5-star recipe review! 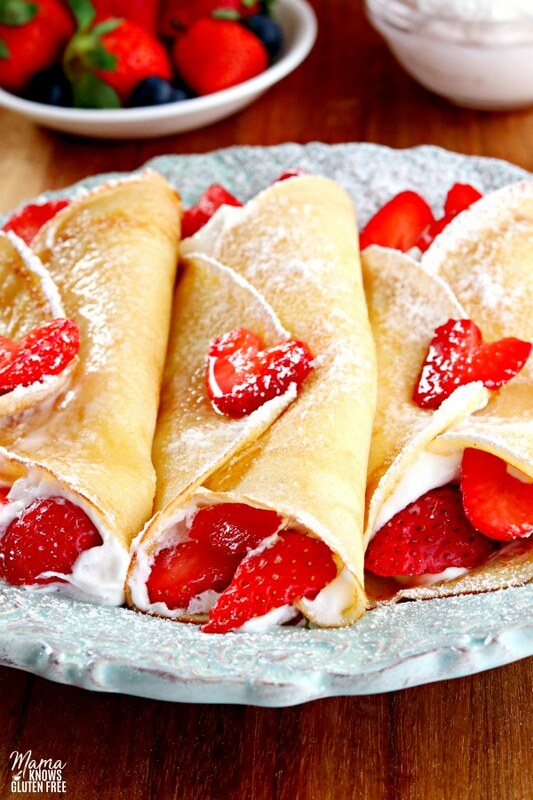 I am so happy that you enjoyed the crepes and found them easy to make. Adding cinnamon sounds delicious. It makes my heart so happy to hear that you love my recipes! You just made my day. Thank you so much.